PHOTO: Allen Ramsey, DWCPhoto.com. Highlands senior defensive lineman Nate Davis (78) sets to leap up before Cooper quarterback Mikey Armour while teammate Nick Bowman (19) gets into position. It is a better feeling than it has been recently. In the past three years, the Highlands Bluebirds football team entered the second game off a loss and two closer than comfortable wins to open the season. But this year, Highlands recorded a nice 42-22 win over the host Cooper Jaguars to start the season. Victories like that give teams the satisfaction of knowing they are doing a lot of things. But at the same time, teams know things can only go up from there if they address areas that need improvement. That's the hope for the Bluebirds when they welcome the Campbell County Camels to Fort Thomas on Friday for the first of just four home games this season. The Camels etched out a 27-23 win over Dixie Heights on Friday in Alexandria to open the season. Game time is 7 p.m. The Highlands defense did the job with the exception of one Cooper drive in the second quarter and a few drives late in the game with the score out of hand. The biggest stat people may talk about for a long time is the five Highlands interceptions. Senior defensive back Joe Steiden put himself alone on top of the Highlands record books with four interceptions in a game. Fellow senior defensive back Harrison Traylor had the other interception and returned it 46 yards for a touchdown in the third quarter. Steiden's four interceptions places him tied for sixth for most interceptions in a game in Kentucky history. One of Steiden's interceptions came on a tipped pass. Highlands junior defensive back Casey Greene said the tip drills the Bluebirds do in practice pay off on plays like that. "The whole teams feeds off the energy and plays well," Greene said. "If we do the drills the right way, it becomes easier in games. It is about being in the right place at the right time too." The Highlands defensive front eight helped set up those interceptions in its 3-5 defensive scheme. The Bluebirds limited the Jaguars to 227 yards rushing and just 17 passing in the win. Most of the Jaguar rushing yards came late in the game when the Bluebirds enjoyed a 42-9 advantage. They scored 42 in a row after the offense got on a roll. Logan Seiple and Nate Davis recorded tackles for a loss in the Bluebird win with Nick Bowman and Crosley New recording one sack each. That is still a huge improvement over last year. Highlands allowed averages of nearly 304 yards rushing and 176 passing per game defensively in 2016. "The entire team has found an identity based on their hard work and commitment to the team," said Brian Weinrich, Highlands Head Coach. "The guys have bought into everything the coaches have tried to sell to them. It starts each day with showing up to get better." Highlands faces a more-experienced Camel offense. The Camels like to line up in the shotgun with senior Austin Hoeh at quarterback and senior Alex Dowds at running back and run a number of different ways. Dowds scored all four touchdowns in the Camel win Friday as the Camels erased a 16-0 deficit at halftime. "Our team has very strong leadership and we have a group of young men that have done the work necessary during the off-season to be confident in our abilities," said Stephen Lickert, Campbell County Head Coach. "Our guys don't quit because they have invested too much sweat equity into the process." But the Camels are not afraid to put the ball in the air. Senior Nic Mayer burned the Bluebirds for a 93-yard touchdown pass in the 24-21 Campbell County win in Alexandria last year. Mayer later booted the game-winning 29-yard field goal to give the Camels their first win over the Bluebirds since 1991 and just their 10th win in 63 meetings. 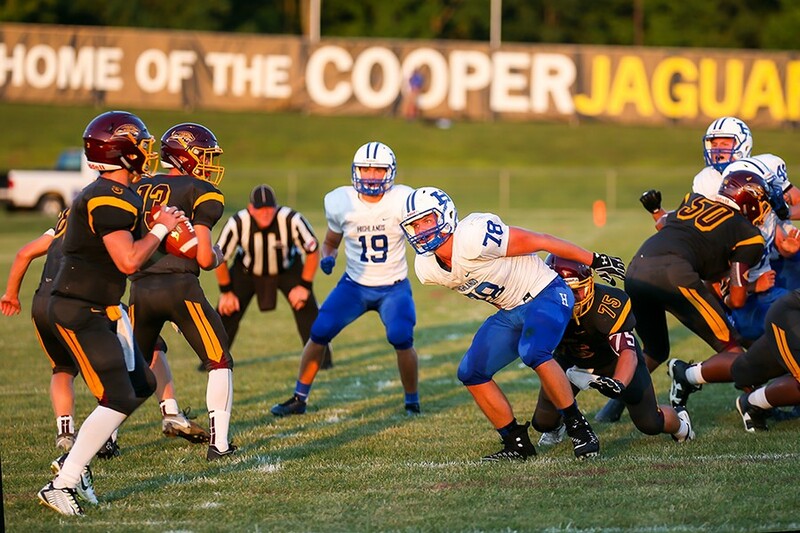 "I felt Campbell County looked very good in all facets of their offense," Weinrich said. "They have some wrinkles that we really have to prepare for. (Dowds) runs the ball hard on each carry. He is their workhorse. Everything goes through (Hoeh) though. He makes them tick. He has a big arm, can make all the throws and is a threat to run the ball at anytime. We have to try to control (Dowds) and not let him have any big runs. The same goes for their passing game. Their wide receivers are a threat to beat you deep, but also a threat to take a screen 80 yards for a touchdown. Their offense is loaded with talent and our defense will have to be disciplined." The Bluebirds hurt themselves with turnovers early offensively. But they completed their last two drives of the first half against Cooper with touchdowns to go up 15-9 at halftime before breaking the game open in the second half using short field position to its advantage. Highlands finished with 251 yards of total offense. Junior running back Cooper Schwalbach led the Blubirds with 150 yards on 29 carries and four touchdowns. The Bluebird offensive line blocked well the entire game not allowing a quarterback. Senior Keaton Huddleston moved from the defensive line to the offensive line in the off-season to add depth there. "Everyone is comfortable with each other and trusts each other to do what we're supposed to do," Huddleston said. "I have a lot of faith in my two (Offensive line) coaches (Wayne Hall and Scott Turner). They've helped me a lot so far. They've made it easier to switch from the defensive line to the offensive line." Highlands quarterback Carl Schoellman completed just 8-of-21 passes for 93 yards in the win over Cooper. That included a 47-yard strike to senior Jared Wogan. Wogan finished with three catches for 56 yards and Nick Veneman had two for nine yards. But Highlands did convert several times on fourth down through the air. "I feel very confident with the passing game," said Zach Deaton, Highlands Offensive Coordinator. "We just wanted to establish the run in the Cooper game. We consistently pushed up five yards a carry so we stayed with it. We still have a lot of athletic guys who can make plays." The Camels still run the 3-3 stack defense. Dowds leads the way at linebacker for the Camels along with senior defensive lineman Brent A. Mills. "They are aggressive on defense," Deaton said. "They have a couple guys who have played there for a couple years and are confident in what they are doing. They are mostly juniors." Dixie Heights returned the opening kickoff for a touchdown. The Colonel offense rushed for 198 yards and passed for 92. Quarterback Paul Guenther led the way going for 132 yards on 11 carries and two touchdowns. "We break down the film and develop a game to stop what Highlands does well," Lickert said. "Each guy on our defense has a responsibility on every play and each guy must execute their responsibility successfully with discipline and max effort every play." Highlands has not started the season 2-0 since 2014 when it won its first six games on its way to its last of 23 state championships. The loss in Alexandria last year started the second-longest losing streak in school history at seven straight.